Fantastic news that our proposals for repurposing one of the region’s most important industrial mills has received Planning Consent following extensive negotiations with the local authority and Historic Environments Scotland. The Category C Listed Peter Scott complex is located on Buccleuch Street, Hawick and occupies a prominent site within the town. It is a ‘weel-kent’ landmark with a widely recognised brand having previously been the largest privately-owned knitwear manufacture in Hawick. The chimney is the last remaining visible landmark of its type in the town. The company was founded in 1878 by knitwear apprentice Peter Scott who initially set up a mill producing the renowned ‘Pesco knitted underwear’. Latterly it was firmly established amongst the most famous knitwear brands of its day. 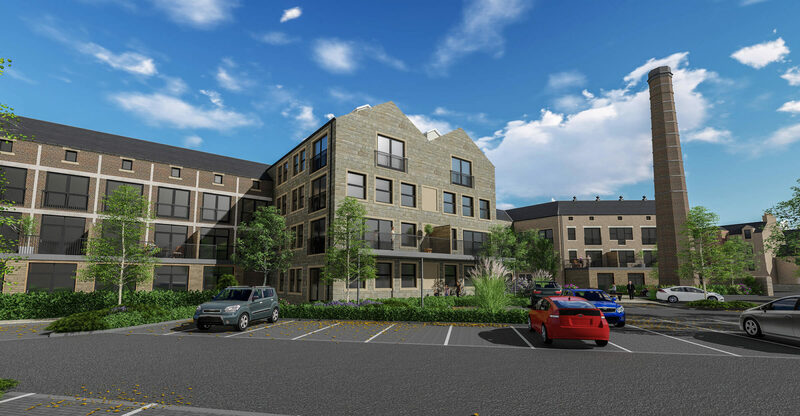 The first phase comprises 10 two bed apartments designed to meet the requirements of over 55’s and there has been 40 notes of interest since obtaining consent. We look forward to working with the developers in delivering this exciting project.